I’m heading for the seat of power! In a manner of speaking, anyway. 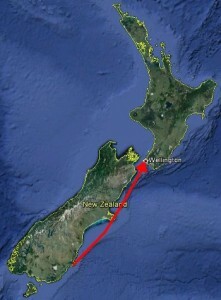 In a couple of weeks I’m getting on a plane, becoming a North Island dweller once more and moving up to Wellington, the capital of New Zealand. I’m going to be working on a project for my employer (I won’t bore you with the details of that here). Ruth and the kids aren’t coming with me. We didn’t want to move the family – not initially at least, because of the potentially temporary nature of the work and because we’re really not sure how long it will last, but it’s going to last a while – at least until late this year (maybe October or later). There’s even a chance it may be extended further – perhaps until sometime next year, but we don’t know anything that far in advance yet. If we reach the end of the school year here in Dunedin and the role is extended, then it’s likely we’ll all move up to Wellington and begin a new era in our family’s history. As far as my (non-academic) career is concerned, Wellington will be a good thing and may lead to great opportunities in the future. So from May the 14th I will be living like a monk for a while! Actually that’s not quite true, I will be back every now and then. My employer will be flying me back to Dunedin once a month, and we’ll be trying to live frugally so that I can afford to fly back once a month in addition to this (flights still aren’t nearly as cheap as I’d like them to be, and although I’ll be doing different work, as it’s a secondment my official job description and salary doesn’t change), so twice a month (or at least thrice every two months, depending on what we can manage) I’ll have my family back. I’ll have a phone-and-Skype marriage for the rest of the time! While the move as a whole will be worthwhile and even a little exciting, this is that part that will undoubtedly be hardest. But while I’m in Wellington I’ll be living like a monk. I’ll be focused on a few things: Work (of course), writing (so the blog output might actually increase while I’m away – I won’t be able to take many books up, so when I can I’ll invest a tablet), and working out (I’ll be going to the gym as much as I can). Wellington is a University city (although not as much so as Dunedin), so I’ll also be on the lookout for opportunities to speak to student groups, but I really don’t know what the “scene” is like up there. Do I have any readers/listeners in Wellington? If so, drop me a line! Lectures via Skype? Why not? Next Next post: Does Richard Carrier Exist? Thou shalt pump iron. Getting to the gym–a great choice! Sort of in Wellington, we drive in from the Kapiti Coast every Sunday for Mass, McDonald’s and visiting my Mother. You’re welcome to join us at McDonald’s sometime.